"Champagne tasting" is music to my ears, so I was very pleased to be invited, along with Aurélie, to Le Dokhan's for a dégustation de champagne as part of my 2014 Ambassador work with Radisson Blu. This boutique hotel, with 41 rooms in total, is my favourite of the 3 hotels based in Paris. It is charming, there are stripes everywhere (i.love.stripes.) and the design is incredibly cosy. The champagne bar itself is in the style of a Ladurée tea-room, with majestic arm-chairs, ornate mirrors and antique furniture. You can also choose from a range of champagne glasses to drink from, and the sommelier will patiently explain to you the taste obtained from each glass. We learnt that the bar changes its champagne every week and favours more artisanal producers over the big-name brands, with a particular interest in bio-agriculture and organice products. We tested a Pierre Peters champagne, a family-run establishment who have been producing champagne for almost 100 years. It was the softest champagne I had ever tasted and by that I mean the bubbles were less vigorous than those of a Moët-Chandon or a Ruinart. 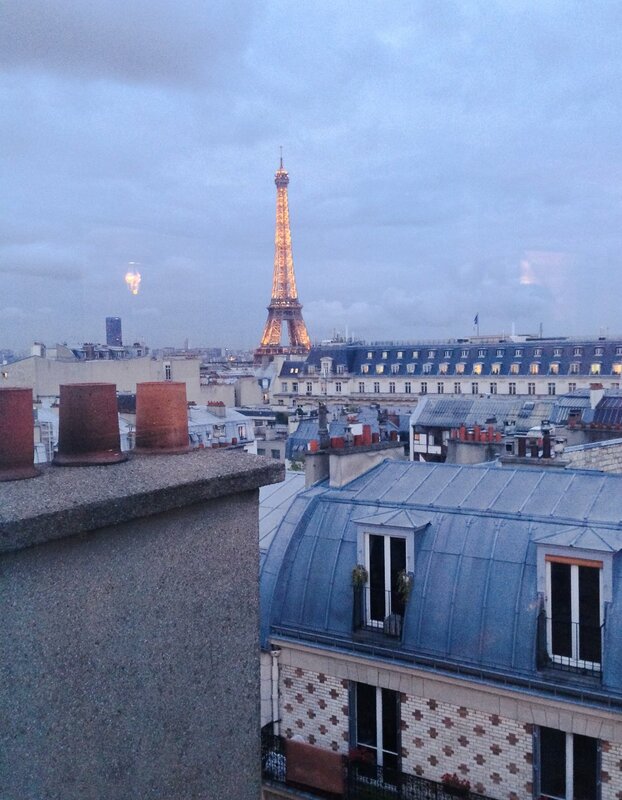 Before moving on to the Metropolitan for dinner, we were given a tour of one of the Eiffel suite, which, as you probably guessed, has a breathtaking view of La Tour Eiffel. Once again, I must underline the excellent service provided by Radisson Blu. It is a recurring theme of my Radisson posts, because the service provided truly embraces the "Yes I Can" attitude that was presented to us all at our very first Radisson meeting. I find the service to be attentive, for example our sommelier left time in between each "coupe" of champagne - but not too much time that we noticed his absence. Similarly, there was no hovering. No-one likes hovering do they, as it's pretty unsettling for the clients. I really enjoyed discovering a new champagne, as well as the charming surroundings, so would therefore visit the champagne bar again for a friend's birthday or with friends visiting from the UK. I would highly recommend Le Dokhan's if you have an occasion to celebrate, such as Mother's Day, or equally if you are visiting Paris and looking for something a little sophisticated. The hotel also rents out the bar for private cocktails /corporate events. For more information, you can visit Le Dokhan's website.